Summary: Straight people should have to come out too. And the more awkward it is, the better. I’ve had Simon Vs The Homo Sapiens Agenda on my to be read pile for quite a long time now. When it was first released it seemed to be an incredibly popular choice of novel, and i don’t really know why it took me so long to pick it up. I went in to this novel knowing absolutely nothing about it and i think that’s the right way to do it. Simon is in high school and if that wasn’t difficult enough, he realises he’s gay while talking to a mysterious guy online and to top it all off he’s being blackmailed by one of his peers. Sounds great, right? He’s also in between a love triangle with his best friends, Nick, Leah and Abby. Simon goes on with his life, playing one of Fagin’s boys in Oliver for the school play and constantly trying to get this mystery man to meet him. First of all, i’d like to say that this took me quite a while to read. I think i was reading it for about a week in total which is a long time for me to read a contemporary novel. I don’t know if that’s because it has a slow started and didn’t hook me from the beginning, or i’m in a little bit of a reading slump. Considering i absolutely loved this novel by the end, i’d say its because i’m in a little bit of a reading slump! As i said, the story developed incredibly throughout and i ended up being connected to the characters and to be honest, fully invested in their lives by the end (i did a lot of squealing). The characters were easily imaginable and great to read about. You get a true sense of Simon and his voice from the writing of the novel and i really loved that. 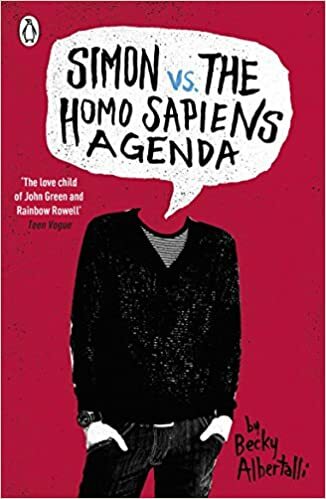 I also think Simon Vs The Homo Sapiens Agenda is one of the best LGBTQ+ books i’ve read in the recent years. I’ve read a lot of awful ones, with awful characterisation of the lifestyle, but this truly showed a teenagers feelings about his situation and how he dealt with coming out. I very much appreciated reading a more ‘true’ account to the LGBTQ+ community! I ended up absolutely loving this novel. It left you constantly guessing who Simon’s mystery emailer was (i guessed correctly and was VERY proud of myself) which kept the story interesting and made you want to read to the end. If you’re looking for an easy contemporary read, or a great LGBTQ+ book (and are one of the few people that haven’t read this yet) i’d definitely pick it up!